Karpuramanjari: You Gotta Heed Angelina’s Advocacy! You Gotta Heed Angelina’s Advocacy! Intriguingly, this view of Aeschylus’ chorus in his play, Agamemnon, Circa 450 BC, is no longer considered valid, particularly in the case of cancer patients, for knowing about cancer onslaught at the very beginning is considered vital to arrest its growth and thereby postpone the inimical death. And that is what has been reiterated once again by Angelina Jolie, one of the world’s most beautiful women, and an incredibly wealthy, Oscar-winning, 37-year-old Hollywood actress and director, when she shared with the world at large about her journey from the diagnosis of her harboring a ‘faulty’ gene, BRCA1, that is known to sharply increase one’s risk for developing breast cancer—the estimated average risk of getting breast cancer being 65%—and ovarian cancer, to her undergoing a preventive double mastectomy surgery to minimize the chances of her getting breast cancer. there are options for women to “take on and take control of” breast cancer and a woman must make her own informed choices. Angelina’s public-health advocacy did achieve its objective, for ever since she made her fight against breast cancer public, the media started pouring in cancer statistics, and seeing them, the public in general started discussing cancer and the complexities associated with its cure in general and the myth of beauty in the context of breast cancer and mastectomy in particular. In appreciation of her advocacy, let us spend a few minutes of our time in knowing what science tells us about cancer in general and breast cancer in particular, as any effort in that direction is sure to enhance our competency to take on the challenges posed by cancer. Cancer involves unregulated cell growth—cells divide and grow without being subjected to apoptosis (the orderly path of growth, division and death that a normal cell follows)—forming into lumps or masses of tissue called tumors, except, of course, in leukemia, where cancer prohibits normal function of blood by abnormal cell division in the bloodstream. It may also spread to distant parts of the body through the lymphatic system or bloodstream—malignant cells are more agile than benign cells. There are around 200 different known cancers afflicting humans. It is too complex to determine what causes cancer. Many things are known to increase the risk of cancer: tobacco use, certain viral infections, radiation, sedentary lifestyle, obesity, environmental pollutants, etc. are known to damage genes or combine with existing genetic faults within cells resulting in cancer. Approximately 5-10 per cent of cancers are said to be hereditary. This complexity is well captured into a definition when Time magazine said: Cancer is an intricate and potentially lethal collaboration of genes gone awry, of growth inhibitors gone missing, of hormones and epigenomes changing and rogue cells breaking free. Coming to breast cancer, it forms in the tissues of the breast, usually the ducts that carry milk and glands that secrete milk. It occurs both in men and women, although male breast cancer is rare. It is still not clearly known how breast cancer is caused. However, factors such as family predisposition, age, race, reproductive and menstrual history, overweight, smoking, drinking excessive alcohol, high-fat diet, sedentary lifestyle are identified as risk factors for breast cancer in females. Breast cancer is the most common cancer among women, accounting for 25-33 per cent of all cancers in women in India. About 5 to 10 per cent of all breast cancers are caused by mutant genes. BRCA1 (Breast-Cancer gene 1) and BRCA2 are known as tumor-suppressor genes that are responsible for repairing DNA. When mutations occur in these genes, the carrier is predisposed to breast and ovarian cancers. Women with mutations in either of these genes have a 56-85 per cent risk of developing breast cancer. Breast cancer develops at a relatively young age. The risk of ovarian cancer is said to be between 10-66 per cent depending upon what mutation they carry. As Jolie said, today it is possible to find out through blood test whether one is carrying any of these abnormal genes. It is suggested that every woman with a mother who developed breast or ovarian cancer when she was under 50 should preferably go for a genetic screening. Ideally, her mother should undergo genetic test first and if tested positive, all her younger female relatives should get tested. Besides BRCA1 and BRCA2, it is desirable to test for the mutants of p53—also called the housekeeping gene, which is known to function as a tumor suppressant —and CHEK2, as any abnormality in it is known to increase the risk of breast cancer by three times. Most of the major hospitals in India are reported to be offering this test. Screening for BRCA1 and BRCA2 is said to cost around Rs 60,000. The next important question is: When to go for surgical intervention? It is said that for a woman with family history of breast cancer and genetic screening that tested positive, it is alright to go for preventive mastectomy, for it will bring down the risk of breast cancer by 80-85 per cent. At the same time, it is also said that preventive mastectomy cannot eliminate breast cancer altogether, for the entire breast tissue cannot be removed. Then the obvious question is: Why, then, preventive mastectomy? One version is: if these two factors are associated with the advanced age of a woman, going for preventive mastectomy makes sense—in any case, it is always an individual choice! There is another glitch: mutation in BRCA1 and BRCA2 is also known to cause ovarian cancer. 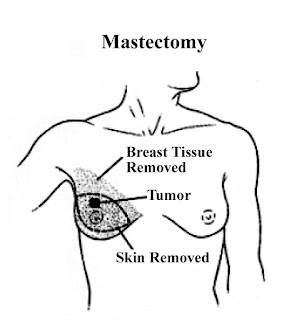 So, mastectomy alone is not sufficient. In such cases, a woman must also get her ovaries surgically removed. In case a woman is diagnosed with breast cancer through mammogram tests, she may have to necessarily go for a kind of mastectomy—either a BCS (Breast Conserving Surgery) with radiation therapy or mastectomy, depending on the stage of the disease. It all depends on how a woman looks at it—for instance, if one is strongly disposed towards “getting it all out as quickly as possible”, she may opt for mastectomy. But existing medical reports indicate that wherever BCS was found an acceptable option, merely going for mastectomy instead has not provided any better chance of survival. A detailed dialogue with the doctors will therefore facilitate a better understanding of the disease which in turn enables one take an appropriate decision vis-à-vis one’s condition. Of course, the big challenge is: to get a doctor willing to spend such a quality time with a patient, particularly in India! Here, it makes great sense to recall what Dr. Charles Sklar of Memorial Sloan Kettering Cancer Center, New York, said, of course, in a different context: although researchers have a good idea of what the young can expect in the first decade following the cancer treatment, no one knows “what happens to (these) people as they age further out, 20 to 30 years beyond that.” What it means is: a lot more needs to be learnt not only about the ‘unknowns’ associated with those adults who had undergone cancer treatment in their childhood and have survived for more than a decade, but also of the very growth of cancer itself. But as Angelina said, there are options offered today by the best of scientific brains and they are all pretty good at managing the disease—so, what matters in the end is: it is for the woman and her family to take informed decisions.